VEX Robotics Program Co-Coordinator Mary Beth Hausken accepts a $5,000 grant check from OP-RF Community Foundation Executive Director Sophia Lloyd. 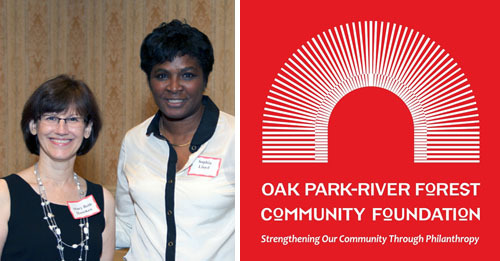 OPEF is thrilled to announce that the Oak Park-River Forest Community Foundation has awarded our VEX Robotics program a $5000 Legacy Grant. The money will be used for the additional motors and equipment necessary for our robots to withstand the rigors of competitive play at regional competitions. Exciting plans for the after-school clubs also include enhancing the annual OPEF local competition, scheduled for January 26, 2013, with upgraded software and hardware in preparation for our hosting a regional competition in 2014. Thanks to OP-RF Community Foundation for helping OPEF VEX Robotics become a leader in innovative educational programs in Illinois!